Discussion in 'General Knife Discussion' started by beachbum2588, Nov 10, 2018. I want one and I think they are one the best bang for your buck,next the GB2. I wanted a Spartan PALLAS,But they are way to expensive for what you get and I really wanted one.So i am on to the ZT 562 CF. If you do a search on the forum you will likely see its one of the most popular zt models. They are nice art knives. Fun flippers. It's still a bit too thick behind the edge than most knives through. So not a great slicer in comparison. Get one anyways cause you'll like it. But get something a bit better for cutting and use this one for everything else. Also note that this model along with other zt models can fail light spine whacks and prying, the lock geometry fails. If you get one, test and see, if it passes your good. If it fails return it for another. Nice knife. Carries well in your front pocket. MolokaiRider and tony281sc2 like this. Great knife, very good looking, good blade shape, steel and ergonomics. One fatal flaw for me though, a deep carry clip that can't be replaced with a normal one. Which is the only reason mine is for sale right now. Absolutely love mine!!! If for some reason I had to sell my collection and keep only one the 0562CF would be it. My 562 is the only framelock I own. I don't like framelocks, but the 562 is that good. Mine is an older one in Elmax, which is a great steel, and it's a shame ZT quit using it. Mo2 and PC87 like this. I absolutely loved mine until it opened up in my pocket while on duty. I was putting my gloves back in my pocket and the blade had crept slightly out and went about a half inch under my thumbnail. The 0562 had fantastic flipping action, partially due to a weak detent. I have since sold it and moved on to mostly fixed blades. I did get sucked back in to folders and bought an 804cf. Personally I like it more than the 0562cf. You get more blade in a lighter package, and I'm a sucker for black blades. Mo2 and NG VI like this. Great timing for your post. I have had all the hinderer design ZT's EXCEPT for the 562. I had always, for some reason, just did not pull the trigger on it. I was looking for one in elmax this past week after my PM2 had bitten me three times due to opening in my front pocket one time to many, and I threw it out in the yard, I did go get it after I cooled off. Received the 562 today and all I can tell you is if I could carry only one this would be it. 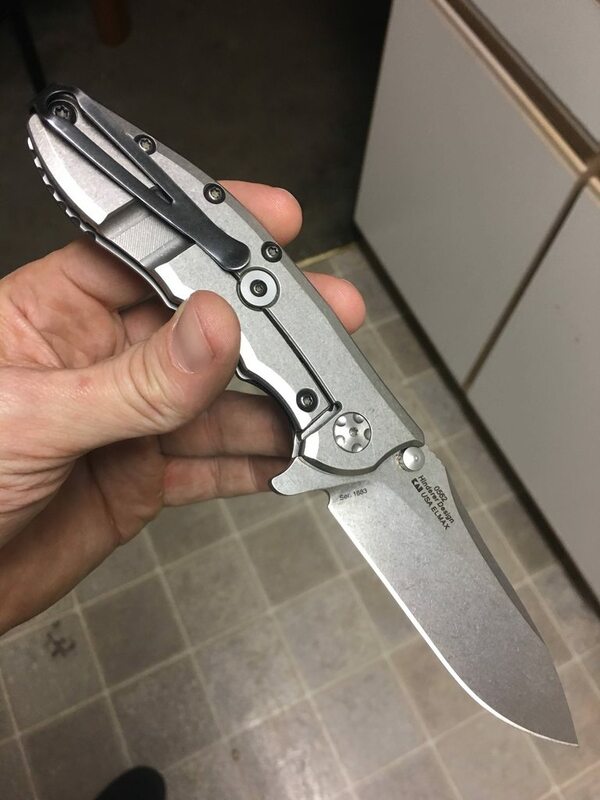 Detent is absolutely perfect, stonewash is perfect, and super sharp out of the box. I went back and forth between the G10 version and CF, but this will be a user and the CF version is just to pretty. I am thinking serious about getting a backup if there are any Black Friday deals out there this yr. It wont be the slicer the PM2 is but its a good all around tough EDC blade for whatever you will need it for. I read this in a earlier thread, You must have been doing some serious stuff to get that blade out in the pocket. The detent on the one I received today is really strong and I did a few tests with it and put it in shorts, jeans, cargo pants, and shook the crap out of them and couldn't get it to come out. I will still however check before going deep in pocket with my hand. MeritedEdge and halden.doerge like this. Mine is a 562 in Elmax, and it's my favorite folder. I say buy it and chances are you'll dig it, if for some reason you don't, you can sell for nearly what you paid for it. It's a no lose situation as far as I'm concerned. Great materials and build quality. Excellent customer service and warranty backing it. One of the best bangs for the buck out there. This is my 0562 in G-10 and Elmax. It was my 5-6 day/week carry and work user for a couple years. Getting it actually sent me into a stretch where I didn’t buy any new knives at all for that couple of years, in fact. Contrary to lock geometry/failure comments, mine passes spine whack tests consistently. The blade is a beefy .16” thick piece of steel, and it’s ground such that it’s not super thin behind the edge. It’s less “slicey” than a PM2. Frankly, I don’t do food prep with my folders, so I don’t care about that. For most of what I cut (zip ties, plastic straps, cardboard), it’s fine. I prefer closer to .12” blade thickness for long cardboard cuts, but the 0562 does the job fine. Detent is firm/strong, and perfect. It requires enough energy to defeat the detent that the thing rockets open. At the same time, mine has broken in so it’s damn near drop shut. This is despite having *never* taken this one down to clean or lubricate inside it. Admittedly, my work environment doesn’t expose it to grit. Cardboard dust is everywhere, but that’s fairly fine. The pivot is butter. Any complaints about the pivot loosening? I had never really hard used it. I was stuffing my pig gloves into my pocket, foolishly I did not have the blade facing the seem but rather the pocket. Playing with my 804, the detent seems fairly strong however I can still open it with a single hard flick. This is scary to me because I have ran with all of my knives clipped to the inside of light weight gym shorts. The only issue that keeps it from being perfect is when I close the knife, the detent hits the lockbar at about 30 degrees, requiring an extra push to close it. If I position my index finger halfway the lockbar when I release it, the flipper tab hits my nail with the blade just past the detent, and then it falls shut without that extra push. These threads are really a lot more useful with pix. I know it's hard to link one from a phone, but at least you could provide a link. I think that for that kind of money, we should expect scales on BOTH sides of the knife. Also, it's a bit on the large side for EDC, unless you live in the 'hood. They advertise it as slicey, but it doesn't look slicey at all, with that blade grind and thick material. I don't like the fact that it has a flipper/detent AND a thumb stud. They should make up their mind. (or hopefully, the thumb stud is easily removable) Someone who uses the thumb stud will probably not like the detent, and someone who uses the flipper will probably not like the stud cluttering up the blade. They should make up their mind what kind of knife it is, and if necessary, make another model in the other variant. For my part, I prefer flippers to thumb studs. Take a pass and pick something with a more "of a piece" design. The Spyderco Gale Bradley 2 is a much nicer knife, in my opinion. CF scales on both sides, a nicer aesthetic design... 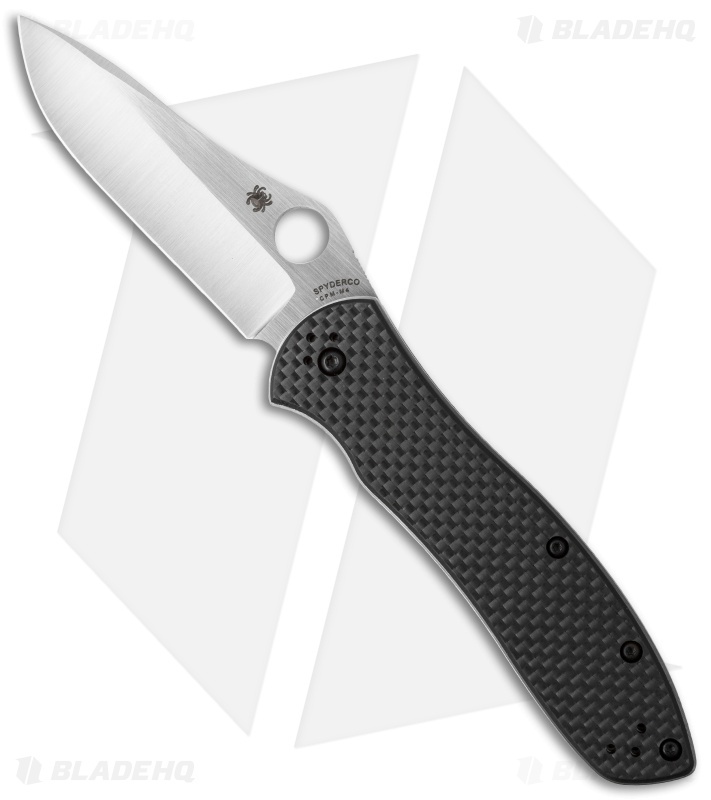 In comparison, the ZT just looks thrown together with good parts, but not really designed, the way the Spyderco is.